I’ve gotten a bit behind in my baking lately, thanks to travel and the holidays. I was planning on doing two different Joanne Chang recipes this weekend, but since one involved making pastry and all my butter was in the freezer, and I had to get up early on Saturday and drive to Salem to pick up my old Kitchen-Aid stand mixer from the repair shop, I didn’t end up doing either of them. 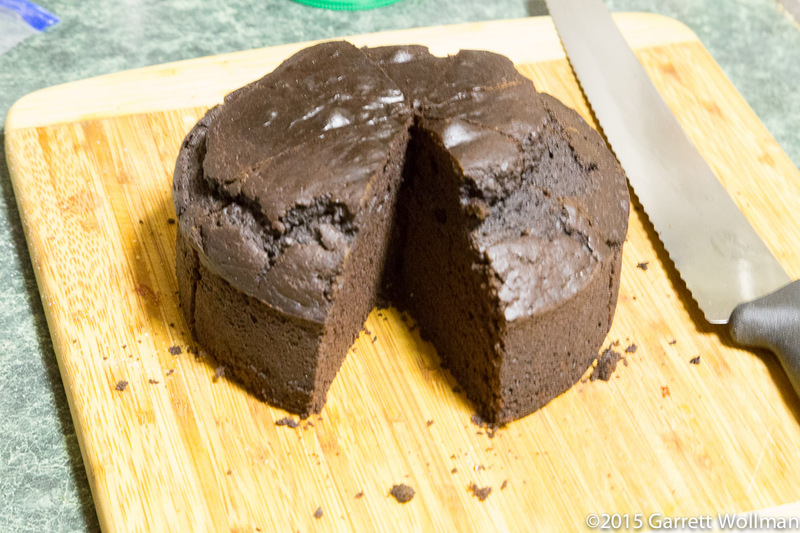 Instead, I did her “vegan low-fat chocolate cake” ( Flour , p. 183), which I had been planning on doing last month for my birthday but ran out of energy for. I’ve had this cake in muffin form at Flour 3 in Cambridge, and I liked it well enough then, so I figured it was worth trying at home. 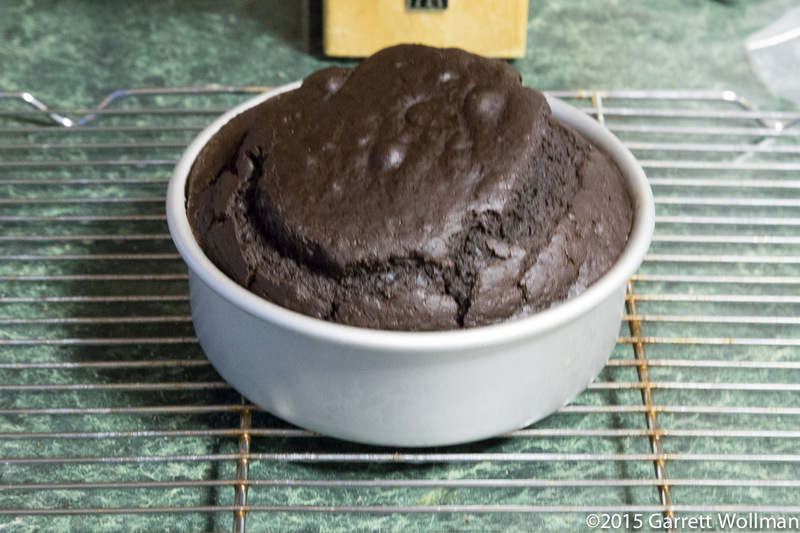 The farthest I got back in December was buying the unusual six-inch cake pan this recipe calls for. All the ingredients are standard, however, and the construction is by the Muffin Method, very much like a mix brownie with water instead of egg as the primary liquid. I made one other (hopefully minor) substitution, using vanilla paste instead of vanilla extract, because I have a whole bottle of it and don’t know how else I’m going to use it up otherwise. (One of those special ingredients that you buy for one recipe and are then stuck with because nothing else you’ve ever made calls for it.) 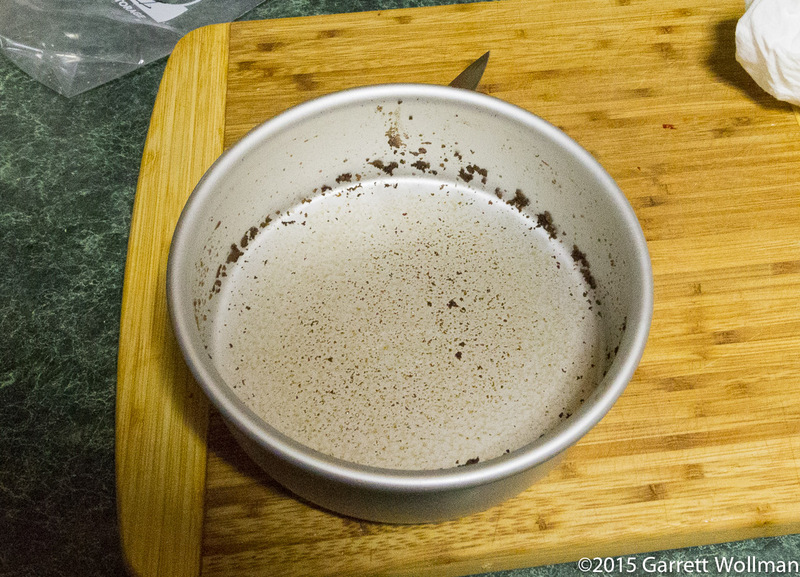 I otherwise stuck by the recipe, including adding espresso powder which I would ordinarily have left out (since I detest the flavor of coffee). So it looks pretty, but how does it taste? Not much, unfortunately. I honestly couldn’t have told that this was supposed to be a chocolate cake if you gave it to me blindfolded — and I can detect an (undesirable) hint of the coffee flavor. I’ll bring it in to work and see what other people think, but my feeling is that the lack of fat — particularly cocoa butter — combined with the light texture of the cake doesn’t serve the chocolate fanatic particularly well. However, I remember the muffin-shaped version at Flour being better, so perhaps it might be better baked in cupcake wrappers, and perhaps glazed or frosted (although then it would no longer be either vegan or low-fat!) to punch up the flavor somewhat. It’s also possible that I overbaked it — one of the main ways to destroy chocolate flavor is to let it evaporate in the oven and waft away. There’s only 40 g of cocoa in the recipe, even if it’s the good stuff, which makes me suspect that there are other ways the flavor could be punched up as well — perhaps by adding some chocolate chunks, as so many cupcakemuffin recipes do. I don’t believe this cake actually meets the FDA regulations to be called “low fat”. But it is certainly lower in fat than a butter cake or pretty much anything with eggs or cocoa butter in it. 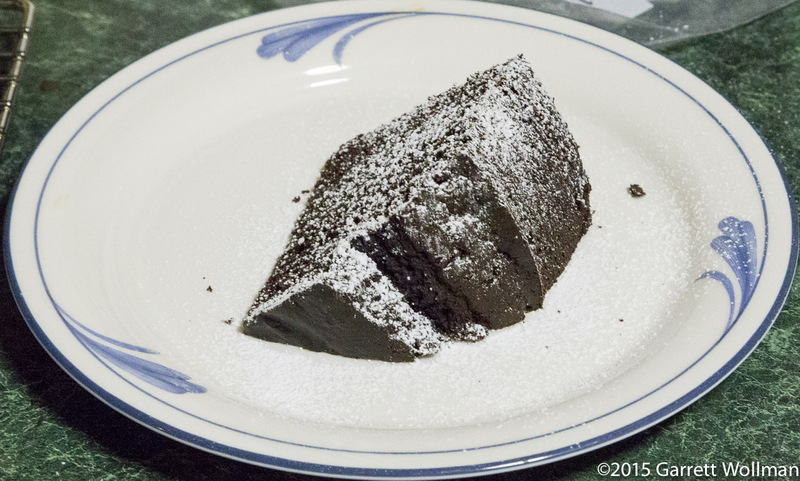 This entry was posted in Food and tagged cake, chocolate, Joanne Chang, recipe. Bookmark the permalink.